LAUNCHING today is the premiere of the Destiny Docu-Series. We selected three unique individuals who recognize their purpose in life and are in pursuit of their Destiny. Here is the story of Alysia Burton Steele, author of Delta Jewels, whose 'Destiny Vision' led her to chronicling the lives of Church Mothers that lived in the Mississippi Delta during the civil rights era. Watch Now. LAUNCHING today is latest Destiny docu-series. We selected three unique individuals who recognize their purpose in life and are in pursuit of their Destiny. Here is the story of Ivben Taqiy, a brilliant artist from Philadelphia whose Destiny Vision is to fulfill his highest purpose as a creative and a Father to his two young kids. Say Yes To Destiny: #Destiny Pre Order Today! Get down to your core and the essence of who you are to reach into your future and maximize who you are! #Destiny in Stores Today! 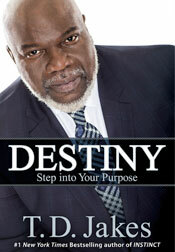 "I met T.D.Jakes several years ago. We've spoken on platforms together. I've witnessed first hand, his ability to transform the way we think about our life's situations. He is uniquely gifted to help anyone determine and navigate their life into a deeper more successful experience in life! Destiny is the road and reading is the way to access your purpose and arrive at a fuller more complete life, career and family experience. " "This book is AMAZING it unlocks so many doors and answers so many real questions you can have about your destiny and what life can hold for you .... This book would have saved me a bunch of lost days." "Destiny drove Moses from obscurity to immortality; destiny took Joseph from betrayal to royalty; destiny took David from a shepherd's field to the palace. Bishop T.D. Jakes, in his masterful presentation of "Destiny," charts a divine path that will renew your dreams and transform your future."